Organization: Contemporary Principles and Practices, Second Edition is the completely updated and revised landmark guide to "macro" organization theory and design, fully grounded in current international practice. International management expert John Child explores the conditions facilitating the development of new organizational forms and provides up-to-date coverage of the key developments driving new organization structure and practice. 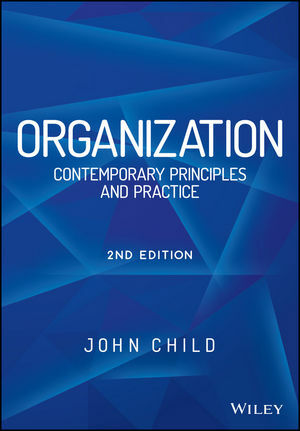 This revised Second Edition includes a new introductory section on Organization Theory as well as a complete Instructor Manual updated with new material on the basic principles of organizational design. Written by one of the foremost scholars, the fully updated Second Edition of this successful text provides executives and advanced business students with a wide-ranging and trustworthy guide to organizations as the conditions for their survival in our global business environment change. JOHN CHILD is an internationally acknowledged expert on organization and international business. He is particularly known for his grounded approach to the practice of management. Among Child's 23 books, Corporate Co-evolution, co-authored with Suzana Rodrigues, won the 2009 Terry Book Award of the Academy of Management.